Taking a turn while riding a bike can be stressful for a new learner. It takes experience and practice to master the bike ride. A basic knowledge of motorcycle and practicing around the neighborhood can help you to do it as a professional. While turning your bike make sure you know the traffic on the street. If you are driving on a broad street, then keep an eye on all the incoming vehicles. If the road is narrow, then you may need to take a sharp turn. In sharp turning, you may not see any incoming obstacle so be careful. The end of the turn can be blocked by vegetation, vanishing point etc. if you have already been on that road then try to remember how the corner looks like. When you approach the turn, slow down your bike a little. If the turn is crowded with vehicles, then make sure you reduce your gear too. Reducing the gear of your bike during slowing down is essential. If the turn is vacant, then you can apply the brakes only to slow down your bike. Apply brakes to your vehicle according to your speed limit. If you approach the turn too quickly, then apply both the brakes to avoid an accident. Above all things, never panic during turning. If you panic your hand might shiver from fear, and it’s not good. Always check the crowd on the road while taking a turn. There are lots of large vehicle on the road. If you see anyone driving speedily, then let them pass by you. Don’t speed up your bike during the turn. Don’t rely on the side mirror too much. Look at the surrounding through your own eyes too for a split second. Don’t turn your head too far while checking the surround or you may turn the handle by accident too. While taking a turn slowly shift your weight toward the bike. To turn, lean a bit and move your handle according to the turning direction. If you are taking a left turn, then lean a bit towards your left side. If you are turning right then lean towards the right. While turning put some downward pressure on the handlebar. When you are finishing the turn, don’t sit up immediately. This may lead to imbalance, and you may lose control.Slowly maintain the original position of your bike and sit softly on your seat.While turning, don’t put too much pressure on your handle. The handle is just to keep the bike in balance. You should keep your eye fixed on the road. Always analyze the road as far as you can. Doing this, you will be aware if there is any incoming obstacle on your way. Only focus on the road when there are no other vehicles around you. 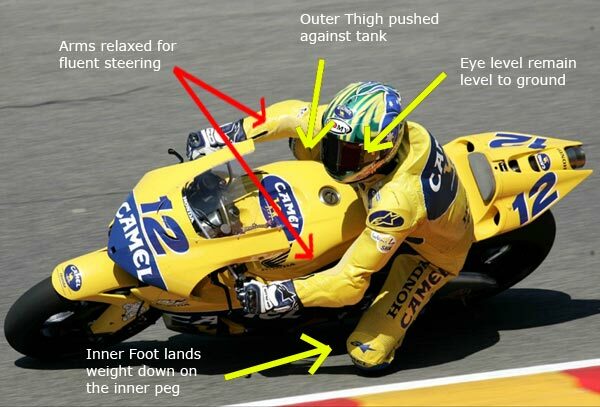 So here are the tips on how to turn a motorcycle. Be careful and keep your safety as the first priority. Happy Driving!